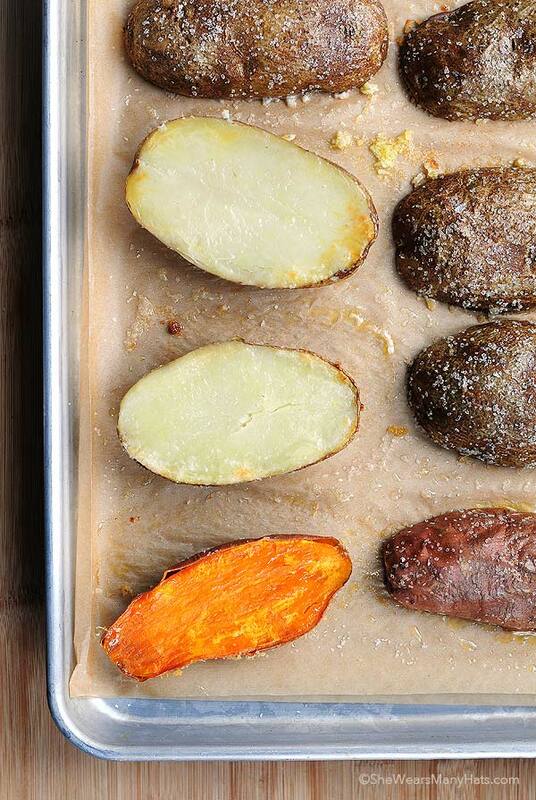 This Quick Baked Potatoes recipe is one of our favorite recipes. It will have you making delicious baked potatoes at home more often. It’s so easy! I’m Irish to the core. Well, at least I think I am. If nothing but for my lack of self control when anything potato is involved, I would say I’m totally Irish. That has to mean something, right? Potatoes are a staple in our home. We have to moderate our intake and how they’re prepared, but a good baked potato is always the perfect standby for us to serve as a side, or as the main star topped with chili, or maybe even something healthy. I’ve learned a shortcut for cooking baked potatoes quicker, and I have to say, tastier. My friend Cindy, tipped me off to this technique for cooking Quick Baked Potatoes a few years back. Cindy is also the person that originally spurred me on to begin this site. I didn’t really know what a blog was when she suggested I look at starting one of my own. So thank you for that, Cindy! And thank you for showing me how to bake a potato faster too. Here’s how it works. It couldn’t be easier. Begin with washed potatoes. We use sweet potatoes for this too. Sweet potatoes are my husband’s favorite. I always toss one in the batch for him. When you’ve washed, and removed any icky or weird looking parts, cut the potatoes in half length wise. Then pour a little olive oil, and sprinkle a good amount of salt on a parchment lined baking sheet. 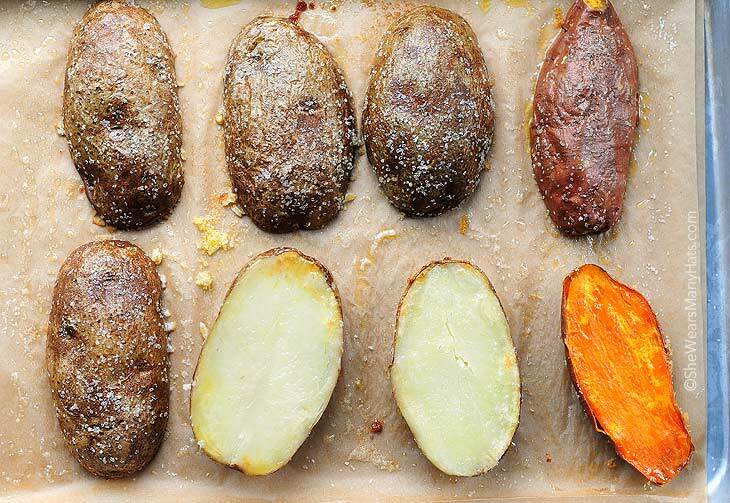 Coat the cut potato halves with the olive oil and salt, and place them on the baking sheet, cut side down. Just use your hands to coat the potatoes with the oil and salt. It’s easier. Plus, olive oil and salt make for an excellent hand scrub. Once they’re coated on all sides, sprinkle a little more salt, then bake at 400°F for about 30-40 minutes, depending on your oven. Check with a fork for doneness and enjoy! When potatoes are baked this way they develop a super tasty skin (which I enjoy even more than the flesh), and they’re the healthiest part of the potato too. They end up being a cross between a baked potato and twice baked potato without all the scraping and re-stuffing involved. Super simple. Super quick. And super satisfying. Try it soon and let me know what you think! Before you go, do you have any tips for cooking vegetables quicker without losing flavor and health benefits? Do share! 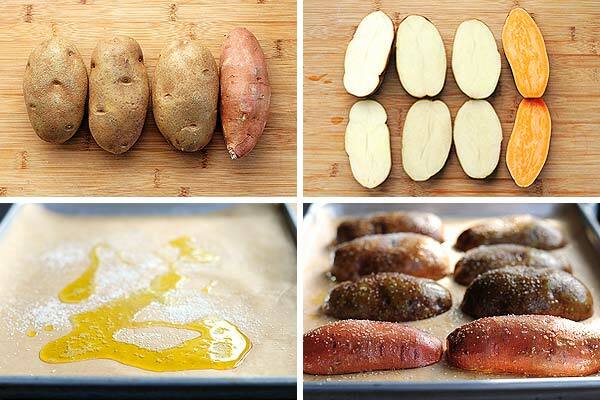 A quicker and delicious way to bake a potato. Preheat oven to 400-degrees F, and line a baking sheet with parchment paper. Drizzle lined baking sheet with olive oil and sprinkle with salt. Cut potatoes in half length wise. Coat potatoes all sides with olive oil and salt, and place cut side down on lined baking sheet. Sprinkle potatoes with additional salt. Bake at 400-degrees F for 30-40 minutes until done. Check with fork for doneness. * Sweet potatoes may be used. Originally published February 21, 2013. Thanks so much for posting this. I do this all the time but don’t cut the potatoes in half. My husband and I always split the potato after it is baked. I feel like an idiot for not thinking of cooking them this way! I cook my potatoes this way too ever since eating some at Cindy’s house. I really miss her. We should get a group together and do a road trip up to TN one weekend. Hey Deborah! I was looking up a recipe on Amy’s site and just happened to come across this post from a while back. So fun… miss you so much and would LOVE to have you make a road trip to TN! I fell in love with these when we visited before Christmas. So smart! Amy, you are so smart! This is a great quickie trick, and I’ve got a bag of potatoes just waiting to be baked. I do something similar also. First I bake the potatoes in th micro for 5-7 minutes, just until they start to soften. Then I rub them with olive oil and kosher salt and bake them in the oven at 400, 425 for about 15 minutes. Totally going to start cutting them in half!!! Can foil be used or is parchment paper a must? Foil can be used but it tends to stick more to the potatoes than baking parchment. I used this way of making baked potatoes due to the reduction in baking. WOW! my family won’t let me cook them any other way now. Ate them skin and all. Most fabulous baked potatoes we have ever had. Happy to hear that you and your family enjoy them too, Amy! It makes me wonder why I never thought to cut it in half. Great idea! I will I will I will! This is such a great idea! I’m trying it tonight. LOVE THIS TECHNIQUE!! Oops, didn’t mean to shout. I’ve always had trouble getting baked potatoes *right*… Can’t wait to try this… And I love the *toss in a sweet potato* idea!… Thanks, Amy! First of all, gorgeous photos – potatoes never looked so pretty! Second, I am about to brave this ice storm and go get potatoes just to have these for dinner tonight. I love how comforting they are! I love it when I can exfoliate, moisturize, and cook all at the same time! These potatoes are enticing. I’ve done it with sweet potatoes but not regular potatoes. Duh! Thanks, Amy. OMG, why didn’t I think of this? So perfect for large families like ours! I’m loving baked sweet potatoes and anything to make that effort quicker and easier rules! Roasting or grilling asparagus was a life changer for me. No longer a pile of mushy ew; they are amazing prepared in a similar manner for a much shorter time! I must are with you Barbara about the asparagus. So Amy there is an idea about 1 other veget@ble. And also I just learned about making a carmalizing sauce for veggies. So far my fi@nce & I have only had it with carrots. The CARMALIZE SAUCE is just brown sug@r, water & lil butter. For thickness. What a great time saver! I need to give this a shot. I’m so impatient waiting for potatoes to bake. Such a great idea and gorgeous shots! I love this concept (and those gorgeous salty photos) , and need to try this out! Thank You, Thank You!!!! We too like sweet potatoes….this is so easy to do while every thing else is cooking.. So easy – why didn’t I think of this before? Duh! but didn’t because it would take too long. This is kind of genius. Just made these for dinner and everything you’ve read is true – they’re great! Couldn’t be easier and I love how the cut side gets browned a little. I had garlic salt in a grinder that I used instead of plain salt and it worked out really well. I will definitely do this again. This is kind of genius – I never would have thought to try this out. You just helped me make dinner tonight in a shorter amount of time! Smiles! I baked potatoes this way this week. Thanks for the great tip for baking them faster than usual! I like putting in the microwave for 10 seconds then bake as she suggested but not so long. We grew potatoes this fall and most are too small for traditional baked potatoes. I found your site last night while trying to come up with something new to do with our little spuds other than mashed potatoes. My boys (8 and 4) loved them! The oldest ate more than his dad and then took the leftovers for lunch today. Thank you so much for the post. They are delicious. YUMMY!!! My family loooooooooves these potatoes! Thank you for the awesome recipe!! 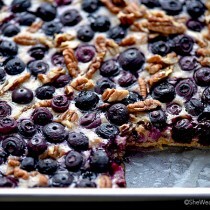 Hey Amy… so fun running across this post while looking up a recipe on your site! Even though I’ve moved to another state, I am still a faithful follower of She Wears Many Hats and have no idea how I’d overlooked this… so imagine my surprise! 🙂 Loved seeing “my” favorite potato recipe and all of the fun comments. Especially loved remembering talking to you about starting your own blog and telling you about PW and how much I loved her and getting you to check her out and how fun it was to “convince” you that you should have a blog of your own and how excited it was to be right there with you as you were thinking of a name for it and helping you check your first few posts for typos and then listening to you think about what to wear on your first TV interview and then hearing about all of the trips you were beginning to take and people you were meeting and friends you were making and then before I knew it YOU were on a weekend at PW’s ranch with other blogger friends and I was so proud of you and always will be, all along the way. Still love your blog and love the way it suits you perfectly. Keep it up my friend… keep it up. I’m sure the best is yet to come! Slice a couple of Vidalia onions in half and throw them on the baking sheet with the potatoes! Fantastic side dish to a good steak! I love this! 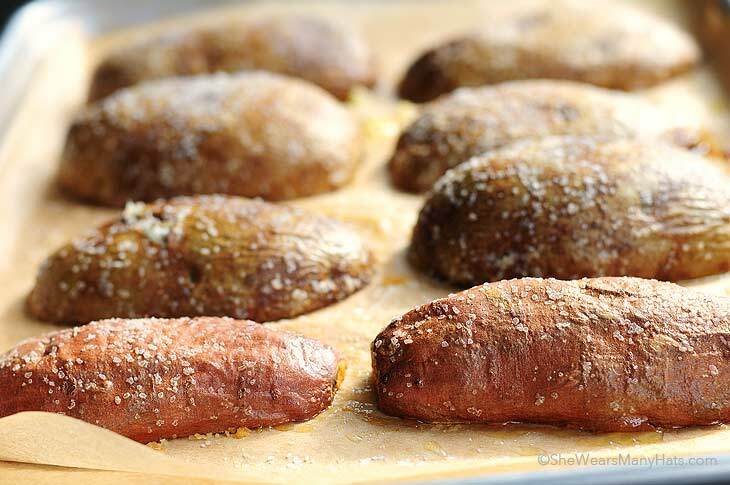 What a great and easy way to have baked potatoes! OMG! I was wanting some sweet potatoes after trying some roasted ones at TJ’s. I found your recipe, went and bought some potatoes and made them tonight. They came out so fanastic that I ate 3 of the 4 I made for dinner. Being I can’t really cook, eating my own cooking like this says a lot! 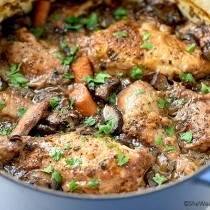 Thank you for posting this recipe!!!! Lay out veggies on lined cookie sheet in a single layer. Drizzle with oil of your choice (I prefer EVOO). Sprinkle with salt, pepper and garlic powder (NEVER garlic salt). Bake at 425 for about 30 to 45 minutes until they reach desired done-ness. I tried this with a very large sweet potato (that would have taken over an hour to bake whole) & it was absolutely delicious! There was no need to add butter or anything else to the finished potato. It was beyond good! Thanks so much. This recipe is a keeper. I see that I forgot to rate the recipe. 5 stars, of course! I just stumbled upon this and made sweet potatoes this way tonight and will never go back to my old ways. Thanks so much for sharing! 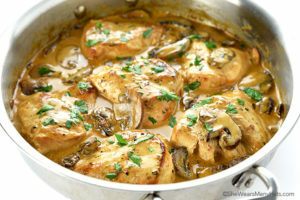 Thank you for posting this great recipe! It was very easy and delicious. My favorite part was that my mom actually loved it and she rarely is a fan of what I make. Yay for you Dina!!! So glad you tried them. They are one of my favorite things to make, especially for groups. So easy! Searched online for way to cook potatoes fast in our busy lives. These were tremendous and done in 30 minutes. Thanks for posting. Can’t wait till try sweet potatoes this way. Amy, thank you so much for this wonderful recipe! It seems so simple, but it’s hands-down the best potato recipes I’ve ever had to work with. Easy, painless, and am trying the sweet potato for the first time tonight. Can’t wait! Yay! It’s absolutely the only way I bake potatoes now. I hope you enjoyed the sweet potatoes too! My Irish husband who prefers rice wants you to know that he loves you … Enough said, except thank you! I came across this post months ago and have been baking my potatoes this way ever since; they are perfectly cooked, every time! Thanks for the great tip! PS… your photos are phenomenal! Seriously, potatoes have never looked so pretty! Nice work! I have used this for quite some time and needed to come back to thank you so much!! I love this recipe/method and am applying it to all kinds of vegetables now. super, really. thanks. Thank you for letting me know! I’m glad it’s been a helpful technique for you. Made these this past weekend…. turned out perfect! Easy, delicious, crispy outside, fluffy inside. Won’t make baked potatoes any other way from now on! Pinned, shared on FB, printed and in my fave recipe binder. Thank you for this one! Hi, so is there no more need to poke the skin before baking? I made a quick search of Pinterest for baked potatoes to go with our steak dinner on Christmas day. I found this recipe and followed it to the letter. The potatoes came out beautifully – they looked just like your pictures(!) – and my family and I loved them! It would have taken so much longer to cook the potatoes whole – they were huge potatoes. Thank you so much for this recipe!! Merry Christmas and Happy New Year! Glad to hear you and your family enjoyed them! I made sweet potatoes following your recipe tonight. That were fantastic! Thank you so much for this quick baked potatoes recipe! They turned out great and I loved the crispy salty potato skins. We could eat these even without any toppings. Like giant french fries, kinda. I totally agree! No need for butter at all. Glad you enjoyed them! Also, I rub each potato with the mixture of sea salt and ground dried vegetables (carrots, celery, onions etc.) and dried garlic powder. On each half I put a slice of unsalted butter or a few drops of olive oil. When they’re almost baked you should put a thick slice of few-time-smoked hot sausage on top of each potato so that nice and aromatic smoky flavor and scent will cover each half and sausage slices become crunchy. If you do not like hot sausages (our’s are homemade with a lot of organic paprika and very hot), I recommend you rub potato halves before bake with a bit of ground red paprika as well.. With this dish I always serve chopped sauerkaut with sunflower oil, ground black pepper and paprika. This is my go to when doing baked potatoes. I make a bunch extra on a Friday or Saturday night so in the morning I cut them into small bite sized pieces and sprinkle with Lawrys and pepper and fry in the skillet to make the best home fries to serve with your eggs. Yum. Excellent plan! Totally doing that with our next batch. These were amazing! I did both regular and sweet potatoes. My family devoured them. And so easy….thanks! Oh my word, the sweet potato was the best I’ve ever eaten! So glad to hear it, Sallee. This continues to be one of our favorite ways to cook both sweet potatoes and russets. Tried these tonight and all three kids LOVED them! You’re a miracle worker!!! Seriously so good! I’ve made this a bunch of times since I read this post and the potatoes come out flawlessly every time! Perfectly crispy yet fluffy on the inside. I’m actually making them tonight ;). I never even post comments on recipe blogs. That’s how much I love this! Haha. Thanks for the recipe :). Glad you enjoy them, Chelsea! They will forever be a family favorite. Made these tonight as directed (with a little additional garlic salt) and they were phenomenal!! I’ve never enjoyed eating a baked potato without sour cream and/or butter, but this was a first!! Thank you so much! Yay, Amy! I haven’t baked a potato any other way since learning this method. So glad to hear that you enjoy it too! Hi there.. My mom has cooked us potatoes this way since I can remember. The only difference is that instead of parchment paper we use Tim foil or just a cookie sheet. 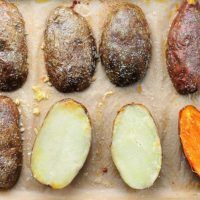 Spray with nonstick then drizzle olive oil or vegetable oil sprinkle with any seasoning you want and use a good deal of seasoning make sure to pome holes in the outer layer of skin of the potatoe I have seen one pop before and man its messy. Once a the potatoe is cooked and a fork can penetrate it with no resostance the potatoes are finished. When you take them out the bottoms will be a golden crispy brown. Serve with sourcream or ranch for dipping. It’s great for bbqs as it is an easy hand food and even after they cool down they are great. I love them the next day they reheat great or I like it right out of the fridge. Can I use canola oil, or just olive oil? I used simple sunflower oil and they came out perfect! Just make sure you coat them thoroughly. This is so smart! Why did I not think of it. Ha! I’m going to do this with sweet potatoes this week! I hope you enjoy the ease of it, Megan! Salty potato skins the best! YUM! My mom always had baked sweet potatoes around. She loves them with butter and a piece of cheese. Memories, missing her already. Let me know how it turns out for you, Jeff! Just wanted to drop a note and let you know that I have been following this method for a year now. Thanks so much for posting! Whenever I bake tatoes, sweet or regular I always refer to this post! I’m so happy that it has been helpful, Michelle! I don’t even know how I stumbled across this recipe but I’m so glad I did! I will never do regular baked potatoes again. These are so easy and so delicious! My picky kids even like them. We also like twice baked and loaded potatoes but we start with this recipe now. Just bake, flip, sprinkle with cheese, crumbled bacon, and green onion and slide back in the oven to melt the cheese. Done! (I like a little dollop of sour cream to finish them off.) 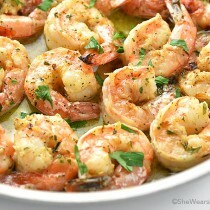 So easy, so delicious, and I love that they reheat well too! I may have commented on this before, but this is a great idea–thanks, Amy!! Amy what a great way to cook potatoes in hurry now why didn’t I think of this lol. I’m a huge fan of sweet potatoes and was wondering if you could cook squash in the same way? ???? Loved them, I used Himalayan salt. Simple and so delicious. Super simple, super quick,, super satisfying and super salty if your not careful. Love it. Second time I made the sweet potatoes I did leave out the salt and they were super yummy. I love baked potatoes but never think of them early enough, so thanks for this recipe. Thank you Google for bringing me here! I always have to look up how to bake a potato every time because I can nevefoulr remembiner temp and lengt foulh. Well This time I had already prepped the potatoes whole with oil and salt, pierced them, wrapped in foil and tossed them in the oven based off of a different recipe. Then I saw the cooking time of over an hour , so I started googling fast baked potato in oven and came across this. Took them right back out, unwrapped them, cut in half, oiled and salted the part that had not been done yet, laid then on one of the strips of foil that I had taken off of the potatoes. Put them back in the oven. Seasoned my steaks and tossed them on the same cookie sheet for 15 minutes since the steaks were still partially frozen. Then, I took everything out to the gas grill and finished cooking it all. I just grilled the steaks on the main part and had the potatoes on the foil on the top rack. Left them there until the steaks were done to our liking. Everything was perfect. Thanks for cutting my cooking time in at least half! Will try sweet potatoes next. We don’t normally eat them but I have a couple that were given to me yesterday. Oh my, these look delicious. Hopefully i’ll be able to bake some one of these days, kudos to you, Amy!???? We tried this recipe for the first time last night and I doubt I will ever bake potatoes any other way! My daughter ate the skin for the first time and my husband raved about how good they were! I have a stoneware pan that I used for baking instead of parchment paper. The cut part of the potato was a perfect, crispy golden brown and then skin was delicious. Thank you so much for this idea!!! So happy to hear it, Jana! It sure is easy. My dad use to cook spuds like this too but with the cut side facing upwards. He’d cut a criss cross pattern ( lattice? )with a sharp knife then brush oil over the top then a light sprinkle of salt and then cook. Once cooked the criss cross pattern would really show up as the cut flesh opened up slightly. Thank you!! I couldn’t remember how my mom made these! Nummy… I use butter under the bottom for extra flavour.